This name uses Eastern Slavic naming customs; the patronymic is Anatolyevich and the family name is Medvedev. Dmitry Anatolyevich Medvedev (Russian: Дми́трий Анато́льевич Медве́дев, tr. Dmitriy Anatolyevich Medvedev; IPA: [ˈdʲmʲitrʲɪj ɐnɐˈtolʲjɪvʲɪtɕ mʲɪˈdvʲedʲɪf], born 14 September 1965) is a Russian politician who is the current Prime Minister. From 2008 to 2012, Medvedev served as the third President of Russia. 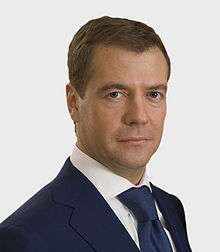 Born to a family of academics, Medvedev graduated from the Leningrad State University Law Department in 1987. Medvedev defended his dissertation in 1990, and worked as a docent at his alma mater, now renamed the Saint Petersburg State University, where he taught Civil and Roman Law until 1999. Medvedev's political career began as the Election Campaign Manager, and later as an adviser of the St. Petersburg Mayor, Anatoly Sobchak. During this time, Medvedev befriended Vladimir Putin. In November 1999, Medvedev was hired by the Russian Presidential Administration, where he worked as the Deputy Chief of Staff. In the 2000 Russian Presidential Elections, Medvedev was Putin's Campaign Manager. On 14 November 2005, Medvedev was appointed First Deputy Prime Minister, and was tasked with overseeing National Priority Projects. Medvedev worked as the Chairman of Gazprom's Board of Directors, a post that he held until 2008. On 10 December 2007, Medvedev was informally endorsed as a candidate for the forthcoming presidential elections by four political parties: United Russia, Fair Russia, Agrarian Party of Russia, and Civilian Power, and was officially endorsed by the United Russia Party on 17 December 2007. Medvedev's candidacy was backed by the popular outgoing President, Vladimir Putin, thus giving a significant boost to his popularity. The 2008 Presidential election, held on 2 March 2008, was won by Medvedev with 70.28% of the popular vote, and he was inaugurated on 7 May 2008. Medvedev did not run for a second term as President, and therefore was appointed Prime Minister by President Vladimir Putin, who won the 2012 Presidential election. On 26 May 2012, Medvedev was appointed to be the Leader of United Russia Party. Regarded as more liberal than his predecessor, Medvedev's top agenda as President was a wide-ranging modernisation programme, aiming at modernising Russia's economy and society, and lessening the country's reliance on oil and gas. During Medvedev's tenure, Russia emerged victorious in the Russo-Georgian War, and recovered from the Great Recession. Recognising corruption as a most severe problem in Russia, Medvedev launched an anti-corruption campaign, and initiated a substantial law enforcement reform. In foreign policy, Medvedev's primary achievements include the signing of the New START treaty, a "reset" of Russia–United States relations, that were severely strained following Russia's war with Georgia, as well as increasing Russia's cooperation with the BRICS-countries, and gaining Russia's admission into the World Trade Organization (WTO) in 2011. Dmitry Medvedev was born on 14 September 1965 in Leningrad, in the Soviet Union. His father, Anatoly Afanasyevich Medvedev (November 1926 – 2004), was a chemical engineer teaching at the Leningrad State Institute of Technology. Dmitry's mother, Yulia Veniaminovna Medvedeva (née Shaposhnikova, born 21 November 1939), studied languages at Voronezh University and taught Russian at Herzen State Pedagogical University. Later, she would also work as a tour guide at Pavlovsk Palace. 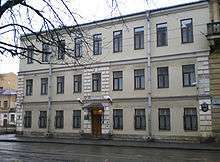 The Medvedevs lived in a 40 m² apartment at 6 Bela Kun Street in the Kupchino district of Leningrad. Dmitry was his parents' only child. The Medvedevs were regarded as Soviet intelligentsia family of the time. His maternal grandparents were Ukrainians, whose surname was Kovalev, originally Koval. Medvedev traces his family roots to the Belgorod region. As a child, Medvedev was bookish and studious, described by his first grade teacher Vera Smirnova as a "dreadful why-asker". After school, he would spend some time playing with his friends before hurrying home to work on his assignments. In the third grade, Medvedev studied the ten-volume Small Soviet Encyclopedia belonging to his father. In the second and third grades, he showed interest in dinosaurs and memorized primary Earth's geologic development periods, from the Archean up to the Cenozoic. In the fourth and fifth grades, he demonstrated interest in chemistry, conducting elementary experiments and involved to some degree with sport. In grade seven, adolescent curiosity blossomed through Svetlana Linnik, his future wife, studying at the same school in a parallel class. The relationship apparently affected Medvedev's school performance. Medvedev calls the school's final exams in 1982 a "tough period when I had to mobilize my abilities to the utmost for the first time in my life." In the autumn of 1982, 17-year-old Medvedev enrolled at Leningrad State University to study law. Although he also considered studying linguistics Medvedev later said he never regretted his choice, finding his chosen subject increasingly fascinating: lucky "to have chosen a field that genuinely interested him and that it was really 'his thing". Fellow students described Medvedev as a correct and diplomatic person who in debates presented his arguments firmly, without offending . During his student years, Medvedev was a fan of the English rock bands Black Sabbath, Led Zeppelin, and Deep Purple, fond of sports and participated in athletic competitions in rowing and weight-lifting. He graduated from the Law Department of Leningrad State University in 1987 (together with Ilya Yeliseyev, Anton Ivanov, Nikolay Vinnichenko and Konstantin Chuychenko, who later became associates). After graduating, Medvedev considered joining the prosecutor's office to become an investigator however, he took an opportunity to pursue graduate studies as the civil law chair, deciding to accept three budget-funded post-graduate students to work at the chair itself. In 1990, Medvedev defended his dissertation titled, "Problems of Realisation of Civil Juridical Personality of State Enterprise" and received his Candidate of Sciences degree in private law. Anatoly Sobchak, a major democratic politician of the 1980s and 1990s was one of Medvedev's professors at the university. In 1988, Medvedev joined Sobchak's team of democrats and served as the de facto head of Sobchak's successful campaign for a seat in the new Soviet parliament, the Congress of People's Deputies of the USSR. After Sobchak's election campaign Medvedev continued his academic career in the position of docent at his alma mater, now renamed to Saint Petersburg State University. He taught civil and Roman law until 1999. According to one student, Medvedev was a popular teacher; "strict but not harsh". During his tenure Medvedev co-wrote a popular three-volume civil law textbook which over the years has sold a million copies. Medvedev also worked at a small law consultancy firm which he had founded with his friends Ilya Yeliseyev and Anton Ivanov, to supplement his academic salary. In 1990, Anatoly Sobchak returned from Moscow to become Chairman of the Leningrad City Council. Sobchak hired Medvedev who had previously headed his election campaign. One of Sobchak's former students, Vladimir Putin, came on board as an adviser. The next summer Sobchak was elected Mayor of the city, and Medvedev became a consultant to City Hall's Committee for Foreign Affairs. It was headed by Putin. In November 1993 Medvedev became the legal affairs director of Ilim Pulp Enterprise (ILP), a St. Petersburg-based timber company. Medvedev aided the company in developing a strategy as the firm launched a significant expansion. Medvedev received 20% of the company's stock. In the next seven years Ilim Pulp Enterprise became Russia's largest lumber company with an annual revenue of around $500 million. Medvedev sold his shares in ILP in 1999. He then took his first job at the central government of Russia. The profits realised by Medvedev are unknown. Medvedev with Vladimir Putin on 27 March 2000 the next day following Putin's victory in the presidential election. In June 1996, Medvedev's colleague Vladimir Putin was brought into the Russian presidential administration. Three years later, on 16 August 1999, he became Prime Minister of Russia. Three months later, in November 1999, Medvedev became one of several from St. Petersburg brought in by Vladimir Putin to top government positions in Moscow. On 31 December he was appointed deputy head of the presidential staff becoming one of the politicians closest to President Putin. During the 2000 Presidential elections he was Putin's campaign manager. Putin won the election with 52.94% of the popular vote. Medvedev was quoted after the election commenting he thoroughly enjoyed the work and the responsibility calling it "a test of strength". As President, Putin launched a campaign against corrupt oligarchs and economic mismanagement. He appointed Medvedev Chairman of Gazprom's board of directors in 2000 with Alexei Miller. Medvedev put an end to the large-scale tax evasion and asset stripping by the previous corrupt management. Medvedev then served as deputy chair from 2001 to 2002, becoming chair for the second time in June 2002, a position which he held until his ascension to Presidency in 2008. During Medvedev's tenure, Gazprom's debts were restructured and the company's market capitalisation grew from $7.8 billion in 2000 to $300 billion in early 2008. Medvedev headed Russia's negotiations with Ukraine and Belarus during gas price disputes. In October 2003 Medvedev replaced Alexander Voloshin as presidential chief of staff. In November 2005 Medvedev moved from the presidential administration of the government when Putin appointed him as the First Deputy Prime Minister of Russia. In particular Medvedev was made responsible for the implementation of the National Priority Projects focusing on improving public health, education, housing and agriculture. The program achieved some major results such as increase of wages in healthcare and education and construction of new apartments but its funding, 4% of the federal budget, was not enough to significantly overhaul Russia's infrastructure. According to opinion polls most Russians believed the money invested in the projects had been spent ineffectively. Following his appointment as First Deputy Prime Minister, many political observers began to regard Medvedev as a potential candidate for the 2008 presidential elections, although Western observers widely believed Medvedev was too liberal and too pro-Western for Putin to endorse him as a candidate. Instead, Western observers expected the candidate to arise from the ranks of the so-called siloviki, security and military officials many of whom were appointed to high positions during Putin's presidency. The silovik Sergei Ivanov and the administrator-specialist Viktor Zubkov were seen as the strongest candidates. In opinion polls which asked Russians to pick their favourite successor to Putin from a list of candidates not containing Putin himself, Medvedev often came out first, beating Ivanov and Zubkov as well as the opposition candidates. In November 2006, Medvedev's trust rating was 17%, more than double than that of Ivanov. Medvedev's popularity was probably boosted by his high-profile role in the National Priority Projects. I am confident that he will be a good president and an effective manager. But besides other things, there is this personal chemistry: I trust him. I just trust him. As 2 March 2008 election approached, the outgoing President, Vladimir Putin, remained the country's most popular politician. An opinion poll by Russia's independent polling organization, the Levada Center, conducted over the period 21–24 December 2007 indicated that when presented a list of potential candidates, 79% of Russians were ready to vote for Medvedev if the election was immediately held. The other main contenders, the Communist Gennady Zyuganov and the LDPR's Vladimir Zhirinovsky both received in 9% in the same poll. Much of Putin's popularity transferred to his chosen candidate, with 42% of the survey responders saying that Medvedev's strength came from Putin's support to him. In his first speech after being endorsed, Medvedev announced that, as president, he would appoint Vladimir Putin to the post of prime minister to head the Russian government. Although constitutionally barred from a third consecutive presidential term, such a role would allow Putin to continue as an influential figure in Russian politics. Putin pledged that he would accept the position of prime minister should Medvedev be elected president. Although Putin had pledged not to change the distribution of authority between the president and prime minister, many analysts expected a shift in the center of power from the presidency to the prime minister post when Putin assumed the latter under a Medvedev presidency. Election posters portrayed the pair side-by-side with the slogan "Together We Win" ("Вместе победим"). Medvedev vowed to work closely with Putin once elected. In December 2007, in preparation for his election campaign, Medvedev announced that funding of the National Priority Projects would be raised by 260 billion rubles for 2008. Medvedev's election campaign was relatively low-key and, like his predecessor, Medvedev refused to take part in televised debates, citing his high workload as first deputy prime minister as the reason. Instead, Medvedev preferred to present his views on his election website <http://www.medvedev2008.ru>. "Freedom is better than non-freedom – this principle should be at the core of our politics. I mean freedom in all its manifestations – personal freedom, economic freedom and, finally, freedom of expression. In the Krasnoyarsk speech, Medvedev harshly condemned Russia's "legal nihilism" and highlighted the need to ensure independence of the country's juridical system and the need for an anti-corruption program. In economy, Medvedev advocated private property, economic deregulation and lower taxes. According to him, Russia's economy should be modernised by focusing on four "I"s: institutions, infrastructure, innovation and investment. Medvedev was elected President of Russia on 2 March 2008. The final election results gave him 70.28% (52,530,712) of votes with a turnout of 69.78% of registered voters. The main contenders, Gennady Zyuganov and Vladimir Zhirinovsky received 17.72% and 9.35% respectively. Three-quarters of Medvedev's vote was Putin's electorate. According to surveys, had Putin and Medvedev both run for president in the same elections, Medvedev would have received 9% of the vote. However, given United Russia's near-total dominance of Russian politics it was given that Medvedev had effectively clinched the presidency when he was nominated as that party's candidate. The fairness of the election was disputed by observers and officials worldwide. Andreas Gross, head of the Parliamentary Assembly of the Council of Europe (PACE) mission, stated that the elections were "neither free nor fair". Moreover, the few western vote monitors bemoaned the inequality of candidate registration and the abuse of administrative resources by Medvedev allowing blanket television coverage. Russian programmer Shpilkin analyzed the results of Medvedev's election and came to the conclusion that the results were falsified by the election committees. However, after the correction for the alleged falsification factor, Medvedev still came out as the winner although with 63% of the vote instead of 70%. According to John P. Willerton, the 2008 presidential elections and Medvedev's inauguration "represented an unprecedented moment in the over thousand-year history of the Russian state, as a politically strong and healthy 55-year-old president willingly turned powers to a similarly vigorous leader." At the time of the elections, Putin was at the height of his popularity. Given his substantial majority in the State Duma, Putin could have easily amended the constitution to allow him to serve a third consecutive term but did not. "I believe my most important aims will be to protect civil and economic freedoms....We must fight for a true respect of the law and overcome legal nihilism, which seriously hampers modern development." His inauguration coincidentally coincided with the celebration of the Victory Day on 9 May. He attended the military parade at Red Square and signed a decree to provide housing to war veterans. On 8 May 2008, Dmitry Medvedev appointed Vladimir Putin Prime Minister of Russia as he had promised during his election campaign. The nomination was approved by the State Duma with a clear majority of 392–56, with only communist deputees voting against. 12 May 2008, Putin proposed the list of names for his new cabinet which Medvedev approved. Most of the personnel remained unchanged from the times of Putin's presidency but there were several high-profile changes. The Minister of Justice, Vladimir Ustinov was replaced by Aleksandr Konovalov; the Minister of Energy, Viktor Khristenko was replaced with Sergei Shmatko; the Minister of Communications, Leonid Reiman was replaced with Igor Shchegolev and Vitaliy Mutko received the newly created position of Minister of Sports, Tourism and Youth policy. In the presidential administration Medvedev replaced Sergei Sobyanin with Sergei Naryshkin as the head of the administration. The head of the Federal Security Service, Nikolai Patrushev, was replaced with Alexander Bortnikov. Medvedev's economic adviser Arkady Dvorkovich and his Press Attaché Natalya Timakova became part of the President's core team. Medvedev's old classmate from his student years, Konstantin Chuichenko, became his personal assistant. Medvedev was careful not to upset the balance of different factions in the Presidential administration and in the government. However, the influence of the powerful siloviki weakened after Medvedev's inauguration for the first time in 20 years. In their place, Medvedev brought in the so-called civiliki, a network of St. Petersburg civil law scholars preferred by Medvedev for high positions. From the beginning of Medvedev's tenure, the nature of his Presidency and his relationship with Vladimir Putin was subject to considerable media speculation. In a unique situation in the Russian Federation's political history, the constitutionally powerful President was now flanked with a highly influential Prime Minister (Putin), who also remained the country's most popular politician. Previous Prime Ministers had proven to be almost completely subordinate to the President and none of them had enjoyed strong public approval, with Putin's previous tenure (1999–2000) as Prime Minister under Boris Yeltsin being the only exception. Journalists quickly dubbed the new system with a practically dual-headed executive as "government by tandem" or "tandemocracy", with Medvedev and Putin called the "ruling tandem". Daniel Treisman has argued that early in Medvedev's presidency, Putin seemed ready to disengage and started withdrawing to the background. In the first year of Medvedev's presidency, two external events threatening Russia—the late-2000s financial crisis and the 2008 South Ossetia war—changed Putin's plans and caused him to resume a stronger role in Russian politics. The long-lingering conflict between Georgia and the separatist regions of South Ossetia and Abkhazia, which were supported by Russia, escalated during the summer of 2008. In the night of 7–8 August, Georgia launched a surprise attack, codenamed "Operation Clear Field", against South Ossetia with 10,000–11,000 soldiers and 75 tanks. Several Russian peacekeepers were killed in the attack, and many South Ossetians who had Russian citizenship. In the early hours of 8 August, Russian military forces launched a counter-offensive against Georgian troops. After five days of heavy fighting, all Georgian forces were routed from South Ossetia and Abkhazia. On 12 August, Medvedev announced an end to the Russian military operation, entitled "Operation to force Georgia into peace". Later on the same day, a peace deal brokered by the French and EU President, Nicolas Sarkozy, was signed between the warring parties. On 26 August, after being unanimously passed by the State Duma, Medvedev signed a decree recognising South Ossetia and Abkhazia as independent states. The five-day conflict cost the lives of 48 Russian soldiers, including 10 peacekeepers, while the casualties for Georgia was 170 soldiers and 14 policemen. The Russian popular opinion of the military intervention was broadly positive, not just among the supporters of the government, but across the political spectrum. Medvedev's popularity ratings soared by around 10 percentage points to over 70%, due to what was seen as his effective handling of the war. Although Putin also had a visible role during the conflict, such as hurrying home from the Beijing Olympics to meet refugees arriving from the conflict zone, it was Medvedev who made the key decisions, authorising the use of force and leading the peace negotiations. In September 2008, Russia was hit by repercussions of the global financial crisis. Before this, Russian officials, such as the Finance Minister, Alexei Kudrin, had said they believed Russia would be safe, due to its stable macroeconomic situation and substantial reserves accumulated during the years of growth. Despite this, the recession proved to be the worst in the history of Russia, and the country's GDP fell by over 8% in 2009. The government's response was to use over a trillion rubles (more than $40 billion U.S. Dollars) to help troubled banks, and initiated a large-scale stimulus programme, lending $50 billion to struggling companies. No major banks collapsed, and minor failures were handled in an effective way. The economic situation stabilised in 2009, but substantial growth did not resume until 2010. Medvedev's approval ratings declined during the crisis, dropping from 83% in September 2008 to 68% in April 2009, before recovering to 72% in October 2009 following improvements in the economy. According to some analysts, the economic crisis, together with the 2008 South Ossetia war, delayed Medvedev's liberal programme. Instead of launching the reforms, the government and the Presidency had to focus their efforts on anti-crisis measures and handling the foreign policy implications of the war. In the economic sphere, Medvedev has launched a modernisation programme which aims at modernising Russia's economy and society, decreasing the country's dependency on oil and gas revenues and creating a diversified economy based on high technology and innovation. The programme is based on the top 5 priorities for the country's technological development: efficient energy use; nuclear technology; information technology; medical technology and pharmaceuticals; and space technology in combination with telecommunications. For Medvedev, the modernisation programme has become one of the most ambitious and important agendas of his presidency. In November 2010, on his annual speech to the Federal Assembly Medvedev stressed for greater privatisation of unneeded state assets both at the federal and regional level, and that Russia's regions must sell-off non-core assets to help fund post-crisis spending, following in the footsteps of the state's planned $32 billion 3-year asset sales. Medvedev said the money from privatisation should be used to help modernise the economy and the regions should be rewarded for finding their own sources of cash. Medvedev has named technological innovation one of the key priorities of his presidency. In May 2009, Medvedev established the Presidential Commission on Innovation, which he will personally chair every month. The commission comprises almost the entire Russian government and some of the best minds from academia and business. Medvedev has also said that giant state corporations will inevitably be privatised, and although the state had increased its role in the economy in recent years, this should remain a temporary move. On 7 August 2009, Dmitry Medvedev instructed the Prosecutor General, Yury Chayka, and the Chief of the Audit Directorate of the Presidential Administration of Russia, Konstantin Chuychenko, to probe state corporations, a new highly privileged form of organisation earlier promoted by President Putin, to question their appropriateness. In June 2010, he visited the Twitter headquarters in Silicon Valley declaring a mission to bring more high-tech innovation and investment to the country. 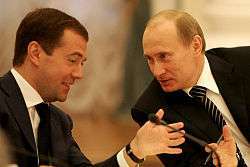 Medvedev has made reforming Russia's law enforcement one of his top agendas, the reason for which was a shooting started by a police officer in April 2009 in one of Moscow's supermarkets. Medvedev initiated the reform at the end of 2009, with a presidential decree issued on 24 December ordering the government to start planning the reform. In early August 2010 a draft law was posted on the Internet at the address http://www.zakonoproekt2010.ru for public discussion. The website was popular, with more than 2,000 comments posted within 24 hours of its opening. Based on citizen feedback, several modifications to the draft were made. On 27 October 2010, President Medvedev submitted the draft to the lower house of the Russian parliament, the State Duma. The State Duma voted to approve the bill on 28 January 2011, and the upper house, the Federation Council followed suit on 2 February 2011. On 7 February 2011, President Medvedev signed the bill into law. The changes came into effect on 1 March 2011. Under the reform, the salaries of Russian police officers will be increased by 30%, Interior Ministry personnel will be cut and financing and jurisdiction over the police will be centralised. Around 217 billion rubles ($7 billion) have been allocated to the police reform from the federal budget for the time frame 2012–2013. "I will repeat one simple, but very painful thing. Corruption in our country has become rampant. It has become commonplace and characterises the life of the Russian society." In July 2008, Medvedev's National Anti-Corruption Plan was published in the official Rossiyskaya Gazeta newspaper. It suggested measures aimed at making sanctions for corruption more severe, such as legislation to disqualify state and municipal officials who commit minor corruption offences and making it obligatory for officials to report corruption. The plan ordered the government to prepare anti-corruption legislation based on these suggestions. The bill that followed, called On Corruption Counteraction was signed into law on 25 December 2008 as Federal Law N 273-FZ. According to Professor Richard Sakwa, "Russia now at last had serious, if flawed, legislation against corruption, which in the context was quite an achievement, although preliminary results were meagre." Russia's score in Corruption Perceptions Index rose from 2.1 in 2008 to 2.2 in 2009, which "could be interpreted as a mildly positive response to the newly adopted package of anti-corruption legislation initiated and promoted by president Medvedev and passed by the Duma in December 2008", according to Transparency International's CPI 2009 Regional Highlights report. On 13 April 2010, Medvedev signed presidential decree No. 460 which introduced the National Anti-Corruption Strategy, a midterm government policy, while the plan is updated every two years. The new strategy stipulated increased fines, greater public oversight of government budgets and sociological research. According to Georgy Satarov, president of the Indem think tank, the latest decree "probably reflected Medvedev's frustration with the fact that the 2008 plan had yielded little result." In January 2011, President Medvedev admitted that the government had so far failed in its anti-corruption measures. On 4 May 2011, Medvedev continued his anti-corruption efforts by signing the Federal Law On Amendments to the Criminal Code and the Code of Administrative Offences of the Russian Federation to Improve State Anti-Corruption Management. The bill raised fines for corruption to up to 100 times the amount of the bribe given or received, with the maximum fine being 500 million rubles ($18.3 million). President Medvedev initiated new policy called "Our New School" and instructed the government to present a review on the implementation of the initiative every year. 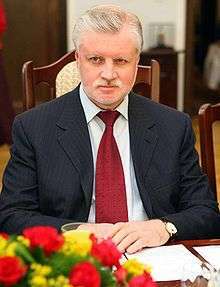 Regional elections held on 1 March 2009 were followed by accusations of administrative resources being used in support of United Russia candidates, with the leader of A Just Russia, Sergey Mironov, being especially critical. Responding to this, Medvedev met with the Chairman of the Central Election Commission of Russia, Vladimir Churov, and called for moderation in the use of administrative resources. In August 2009, Medvedev promised to break the near-dominant position of United Russia party in national and regional legislatures, stating that "New democratic times are beginning". 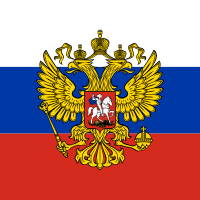 The next regional elections were held on 11 October 2009 and won by United Russia with 66% of the vote. The elections were again harshly criticised for the use of administrative resources in favour of United Russia candidates. Communist, LDPR and A Just Russia parliamentary deputies staged an unprecedented walkout on 14–15 October 2009 as a result. Professor Richard Sakwa has noted, that although Medvedev has often promised to stand up for more political pluralism, after the 2009 regional elections, a gulf had formed between Medvedev's words and the worsening situation, with the question arising "whether Medvedev had the desire or ability to renew Russia's political system." On 26 October 2009, the First Deputy Chief of Staff, Vladislav Surkov, warned that democratic experiments could result in more instability and that more instability "could rip Russia apart". On 6 November 2010, Medvedev vetoed a recently passed bill which restricted antigovernment demonstrations. The bill, passed on 22 October, notably prohibited anyone who had previously been convicted of organizing an illegal mass rally from seeking permission to stage a demonstration. In late November 2010, Medvedev made a public statement about the damage being done to Russia's politics by the dominance of the United Russia party. He claimed that the country faced political stagnation if the ruling party would "degrade" if not challenged; "this stagnation is equally damaging to both the ruling party and the opposition forces." In the same speech, he said Russian democracy was "imperfect" but improving. BBC Russian correspondents reported that this came on the heels of discontent in political circles and opposition that the authorities, in their view, had too much control over the political process. 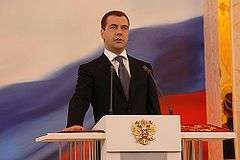 In his first State of the Nation address to the Russian parliament on 5 November 2008, Medvedev proposed to change the Constitution of Russia in order to increase the terms of the President and State Duma from four to six and five years respectively (see 2008 Amendments to the Constitution of Russia). Medvedev on 8 May 2009, proposed to the legislature and on 2 June signed into law an amendment whereby the chairperson of the Constitutional Court and his deputies would be proposed to the parliament by the president rather than elected by the judges, as was the case before. In May 2009, Medvedev set up the Presidential Commission of the Russian Federation to Counter Attempts to Falsify History to the Detriment of Russia's Interests. In August of the same year, he stated that opposes the equating of Stalinism with Nazism. Defending Stalinism, Medvedev denies the involvement of the Soviet Union to the unleashing of the World War II together with the Nazi Germany. Arguments of the European Union and of the OSCE were called a lie. If believe to Dmitry Medvedev, it was Joseph Stalin who in fact "ultimately saved Europe". In a speech on 15 September 2009, Medvedev stated that he approved of the abolition in 2004 of direct popular elections of regional leaders, effectively in favour of their appointment by the Kremlin, and added that he didn't see a possibility of a return to direct elections even in 100 years. In 2009, Medvedev proposed an amendment to the election law which would decrease the State Duma election threshold from 7% to 5%. The amendment was signed into law in Spring 2009. Parties receiving more than 5% but less than 6% of the votes will now be guaranteed one seat, while parties receiving more than 6% but less than 7% will get two seats. These seats will be allocated before the seats for parties with over 7% support. 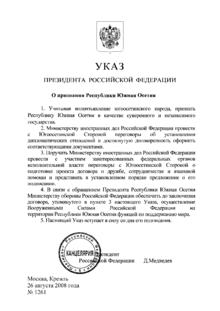 The Russian election law stipulates that parties with representatives in the State Duma (currently United Russia, Communist Party of the Russian Federation, Liberal Democratic Party of Russia and A Just Russia) are free to put forward a list of candidates for the Duma elections, while parties with no current representation need first to collect signatures. Under the 2009 amendments initiated by Medvedev, the amount of signatures required was lowered from 200,000 to 150,000 for the 2011 Duma elections. In subsequent elections, only 120,000 signatures will be required. 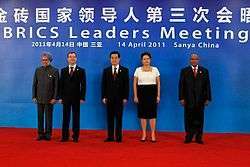 BRICS leaders in 2011 – Manmohan Singh, Medvedev, Hu Jintao, Dilma Rousseff and Jacob Zuma. Medvedev and South Korean President Lee Myung-bak, 2010. In his address to the parliament on 5 November 2008 he also promised to deploy the Iskander missile system and radar-jamming facilities in Kaliningrad Oblast to counter the U.S. missile defence system in Eastern Europe. Following U.S. President Barack Obama's announcement on 17 September 2009, that Washington would not deploy missile-defense elements in the Czech Republic and Poland, Dmitry Medvedev said he decided against deploying Iskander missiles in Russia's Kaliningrad Oblast. On 21 November 2011, Medvedev claimed that the war on Georgia had prevented further NATO expansion. In 2011, during the performance at the Yaroslavl Global Policy Forum, President Medvedev has declared that the doctrine of Karl Marx on class struggle is extremist and dangerous. Progressive economic stratification which can be less evident in period of economic growth, leads to acute conflicts between rich and poor people in period of downturn. In such conditions, the doctrine on class struggle is being revived in many regions of the world, riots and terrorist attacks become reality, by opinion of Medvedev. During the official visit to Armenia, 7 April 2016 year, Prime Minister Dmitry Medvedev visited the Tsitsernakaberd Memorial Complex to pay tribute to the victims of the Armenian Genocide, which was committed by the Young Turks and the Turkish nationalists under the leadership of Mustafa Kemal Atatürk (1915–1923). Medvedev laid flowers at the Eternal Fire and honored the memory of the victims with a minute of silence. Russia recognized the crime yet in 1995 year. Although the Russian constitution clearly apportions the majority of power to the President, speculation arose over the question of whether it was Medvedev or Prime Minister Vladimir Putin who actually wielded the most power. According to The Daily Telegraph, "Kremlin-watchers" note that Medvedev uses the more formal form of 'you' (Вы, 'vy') when addressing Putin, while Putin addresses Medvedev with the less formal 'ty' (ты). According to a poll conducted in September 2009 by the Levada Center in which 1,600 Russians took part, 13% believed Medvedev held the most power, 32% believed Putin held the most power, 48% believed that the two shared equal levels of influence, and 7% failed to answer. However, Medvedev attempted to affirm his position by stating, "I am the leader of this state, I am the head of this state, and the division of power is based on this." As both Putin and Medvedev could have run for President in the 2012 general elections, there was a view from some analysts that some of Medvedev's contemporaneous actions and comments at the time were designed to separate his image from Putin's: examples noted by the BBC included his dealings in late 2010 with NATO and the United States, possibly designed to show himself as being better able to deal with Western nations, and comments in November about the need for a stronger opposition in Russian politics, to present himself as a moderniser. The BBC also noted that other analysts believed the split to be exaggerated, that Medvedev and Putin were "trying to maximise support for the authorities by appealing to different parts of society". There was belief that the court verdict on former oligarch Mikhail Khodorkovsky and his partner Platon Lebedev, both of whom funded opposition parties before their arrests, would indicate whether or not Putin was "still calling all the shots". On 24 September 2011, while speaking at the United Russia party congress, Medvedev announced that he would recommend the party nominate Vladimir Putin as its presidential candidate and that the two men had long ago cut a deal to allow Mr Putin to return to the presidency in 2012 after he was forced to stand down in 2008 by term limits. This switch was termed by many in the media as "rokirovka", the Russian term for the chess move "castling". Medvedev said he himself would be ready to perform "practical work in the government". Putin accepted Medvedev's offer the same day, and backed him for the position of the Prime Minister of Russia in case the United Russia, whose list of candidates in the elections Medvedev agreed to head, would win in the upcoming Russian legislative election. The same day the Russian Orthodox Church endorsed the proposal by President Medvedev to let Putin return to the post of President of Russia. On 22 December 2011, in his last state of the nation address in Moscow, Medvedev called for comprehensive reform of Russia's political system — including restoring the election of regional governors and allowing half the seats in the State Duma to be directly elected in the regions. "I want to say that I hear those who talk about the need for change, and understand them", Medvedev said in an address to the Duma. "We need to give all active citizens the legal chance to participate in political life." However, the opposition to the ruling United Russia party of Medvedev and Prime Minister Putin dismissed the proposals as political posturing that failed to adequately address protesters who claimed 4 December election was rigged. On 7 May, on his last day in office, Medvedev signed the last documents as the head of state: in the sphere of civil society, protection of human rights and modernization. He approved the list of instructions by the results of the meeting with the Presidential council on Civil Society and Human Rights, which was held on 28 April. Medvedev also approved with his decree "Presidential programme for raising skills of engineers for 2012–2014" for modernization and technological development of the Russian economy. Medvedev's stepping aside for Putin's return was seen by many in Russia as anti-democratic and played a part in the protests that erupted in cities around Russia following Putin's election. On 7 May 2012, the same day he ceased to be the President of Russia, Dmitry Medvedev was nominated by President Vladimir Putin to the office of Prime Minister. 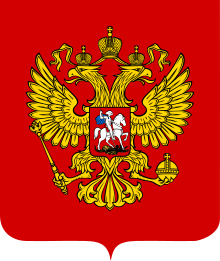 On 8 May 2012, the State Duma of the Russian Federation voted on the nomination submitted by the new President, and confirmed the choice of Medvedev to the post. Putin's United Russia party, now led by Medvedev, secured a majority of the Duma's seats in the 2011 legislative election, winning 49% of the vote, and 238 of the 450 seats. 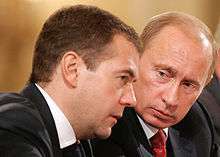 Medvedev's nomination to the office of Prime Minister was approved by the State Duma in a 299–144 vote. Medvedev took office as Prime Minister of Russia also on 8 May 2012, after President Vladimir Putin signed the decree formalizing his appointment to the office. On 19 May 2012 Dmitry Medvedev took part in the G-8 Summit at Camp David, in the United States, replacing President Putin, who decided not to represent Russia in the summit. Medvedev was the first Prime Minister to represent Russia at a G-8 meeting. On 21 May 2012 his Cabinet was appointed and approved by the President. On 26 May, he was approved and officially appointed as the Chairman of United Russia, the ruling Party. Earlier in the same week Medvedev was officially joined to the party and thereby became Russia's first prime minister affiliated to a political party. In the wake of the 2014 Ukrainian revolution, Russian military forces took control of the Crimean Peninsula. On 31 March 2014 Medvedev was the first Russian leader to visit Crimea since the peninsula became part of Russia on 18 March. During his visit he announced the formation of the Federal Ministry for Crimea Affairs. Medvedev is married and has a son named Ilya Dmitrevich Medvedev (born 1995). His wife, Svetlana Vladimirovna Medvedeva, was both his childhood friend and school sweetheart. They married several years after their graduation from secondary school in 1982. Medvedev is a devoted fan of British hard rock, listing Led Zeppelin, Black Sabbath, Pink Floyd, and Deep Purple as his favorite bands. He is a collector of their original vinyl records and has previously said that he has collected all of the recordings of Deep Purple. As a youth, he made copies of their records, even though these bands were then on the official state-issued blacklist. In February 2008, Medvedev and Sergei Ivanov attended a Deep Purple concert in Moscow together. During a visit to Serbia, Medvedev received the highest award of the Serbian Orthodox Church, the Order of St. Sava, for "his contribution to the unity of the world Orthodoxy and his love to the Serbian people." Despite a busy schedule, Medvedev always reserves an hour each morning and again each evening to swim and weight train. He swims 1,500 metres (4,900 ft) twice a day. He also jogs, plays chess, and practices yoga. Among his hobbies are reading the works of Mikhail Bulgakov and he is also a fan of the Harry Potter series after asking J. K. Rowling for her autograph when they met during the G-20 London Summit in April 2009. He is also a fan of football and follows his hometown professional football team, FC Zenit Saint Petersburg. Medvedev is an avid amateur photographer. In January 2010, one of his photographs was sold at a charity auction for 51 million rubles (US$1,750,000), making it one of the most expensive ever sold. The photo was purchased by Mikhail Zingarevich, a co-founder and member of the board of directors of the Ilim Group at which Medvedev worked as a lawyer in the 90s. Medvedev keeps an aquarium in his office and cares for his fish himself. Medvedev owns a Neva Masquerade male cat named Dorofei. Dorofei used to fight with a cat belonging to Mikhail Gorbachev—who was Medvedev's neighbor—so the Medvedevs had to have Dorofei neutered. Medvedev's reported 2007 annual income is $80,000, and he reported approximately the same amount as bank savings. Medvedev's wife reported no savings or income. They live in an upscale apartment house "Zolotye Klyuchi" in Moscow. On the Runet, Medvedev is sometimes associated with the Medved meme, linked to padonki slang, which resulted in many ironical and satirical writings and cartoons that blend Medvedev with a bear. (The word medved means "bear" in Russian and the surname "Medvedev" is a patronymic which means "of the bears"). Medvedev is familiar with this phenomenon and takes no offense, stating that the web meme has the right to exist. Medvedev speaks English, in addition to his native Russian, but during interviews he only speaks Russian. Medvedev wrote two short articles on the subject of his doctoral dissertation in Russian law journals. He is also one of the authors of a textbook on civil law for universities first published in 1991 (the 6th edition of Civil Law. In 3 Volumes. was published in 2007). He is the author of a university textbook, Questions of Russia's National Development, first published in 2007, concerning the role of the Russian state in social policy and economic development. He is also the lead co-author of a book of legal commentary entitled, A Commentary on the Federal Law "On the State Civil Service of the Russian Federation". This work considers the Russian Federal law on the civil service, which went into effect on 27 July 2004, from multiple perspectives — scholarly, jurisprudential, practical, enforcement- and implementation-related. In October 2008, President Medvedev began posting a videoblog at the presidential website. His videoblog posts have also been posted in the official LiveJournal community blog_medvedev since 21 April 2009 by the Kremlin administration. In June 2011 Medvedev participated in launching of the "Eternal Values" project of RIA Novosti together with Russian Chapter of Wikimedia Foundation. RIA Novosti granted free Creative Commons licenses to a one hundred of its images, while Medvedev registered as Dmitry Medvedev for RIAN and personally uploaded one of those photographs to Wikimedia Commons. On 13 April 2009, Medvedev gave a major interview to the Novaya Gazeta newspaper. The interview was the first one he had ever given to a Russian print publication and covered such issues as civil society and the social contract, transparency of public officials and Internet development. ↑ First Deputy Prime Minister Dmitry Medvedev Endorsed for the Next President's Post Archived 10 May 2013 at the Wayback Machine., Voice of Ruddia, 10 December 2007. Archived 10 May 2013 at the Wayback Machine. ↑ "Transcript interview, First Deputy Chairman of the Government of the Russian Federation Dmitry Medvedev" (in Russian). Government of the Russian Federation. 24 January 2008. Archived from the original on 24 August 2011. Retrieved 26 July 2008. 1 2 3 4 5 6 Willerton, John (2010). "Semi-presidentialism and the evolving executive". In White, Stephen. Developments in Russian Politics. 7. Duke University Press. ISBN 9780230224490. 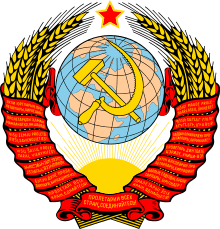 ↑ United Russia endorses D Medvedev as candidate for presidency Archived 4 March 2008 at the Wayback Machine. ITAR-TASS, 17 December 2007. Archived 4 March 2008 at the Wayback Machine. ↑ (Russian) О регистрации Дмитрия Анатольевича Медведева кандидатом на должность Президента Российской Федерации Archived 5 March 2008 at the Wayback Machine., Decision No. 88/688-5 of the Central Election Commission of the Russian Federation, 21 January 2008. Archived 5 March 2008 at the Wayback Machine. ↑ Putin's Chosen Successor, Medevedev, Starts Campaign (Update2) Archived 16 January 2008 at the Wayback Machine., Bloomberg.com, 11 January 2008. ↑ Drive Starts to Make Putin 'National Leader' Archived 5 May 2008 at the Wayback Machine. The Moscow Times, 8 November 2007 Archived 5 May 2008 at the Wayback Machine. ↑ Putin seeks prime minister's post Archived 8 March 2008 at the Wayback Machine. Associated Press, 17 December 2007. Archived 8 March 2008 at the Wayback Machine. ↑ Putin's successor dismisses fears of state "grab" Archived 21 January 2008 at the Wayback Machine., Reuters, 17 January 2008. Archived 21 January 2008 at the Wayback Machine. ↑ Medvedev decrees to provide housing to war veterans Archived 22 December 2008 at the Wayback Machine. – ITAR-TASS, 7 May 2008, 15.27 Archived 22 December 2008 at the Wayback Machine. ↑ "All the Next President's Men". Russia Profile. 19 December 2007. ↑ Lavrov, Anton (2010). Ruslan Pukhov, ed. The Tanks of August. Centre for Analysis of Strategies and Technologies. p. 49. ISBN 978-5-9902320-1-3. ↑ Statement on the Situation in South Ossetia Archived 16 October 2011 at the Wayback Machine. Website of the President of Russia, 8 August 2008. ↑ "Russia tells regions to join privatization drive". Investing.com. 30 November 2010. ↑ "Privatization in regions to yield tens of billions of rbls-Kremlin". Itar-tass.com. Retrieved 19 February 2011. ↑ "Russia Profile Weekly Experts Panel: Will Police Reform Result in Name Change Only?". Russia Profile. 27 August 2010. ↑ "Medvedev submits draft police law to Russian lower house". RIA Novosti. 27 October 2010. ↑ "Russia to spend around $7 billion on police reform in 2012–2013". RIA Novosti. 9 September 2010. ↑ National Anti-Corruption Plan Archived 16 October 2011 at the Wayback Machine. Website of the President of Russia, 31 July 2008. ↑ "Itar-Tass". Itar-Tass. Retrieved 28 September 2010. ↑ Andrew Osborn. Medvedev Creates History Commission, Wall Street Journal, 21 May 2009. ↑ Steve Gutterman and Vladimir Isachenkov. Medvedev: Russia to deploy missiles near Poland, Associated Press, 5 November 2008. ↑ Russia never placed Iskander missiles in Kaliningrad – Navy chief, RIA Novosti, 1 October 2009. ↑ "Medvedev insists he's the boss". Television New Zealand. 30 March 2009. Archived from the original on 19 September 2011. Retrieved 28 September 2011. ↑ "Russia 'to work with Nato on missile defence shield'". BBC News. 20 November 2010. Retrieved 19 February 2011. ↑ Ostalski, Andrei (15 December 2010). "Russia's most important court trial". BBC News. Retrieved 19 February 2011. ↑ Osborn, Andrew (24 September 2011). "Vladimir Putin on course to be Russia's next president as Dmitry Medvedev steps aside". The Daily Telegraph. Retrieved 25 September 2011. ↑ "Russia's Putin set to return as president in 2012". BBC News. 24 September 2011. Retrieved 25 September 2011. ↑ (Russian) "Putin signs first decree as president", Itar Tass, May 7, 2012 Archived 14 June 2013 at the Wayback Machine.. Itar-tass.com. Retrieved 10 May 2012. ↑ Medvedev becomes Russia's PM: Voice of Russia Retrieved 10 May 2012. ↑ Medvedev Will Run Russia to Tune of Hard-Rock Band Deep Purple Archived 8 September 2008 at the Wayback Machine.. Retrieved 8 March 2008. ↑ Nicholas II, FC Zenit, Black Sabbath – Medvedev's favorite things Archived 4 March 2008 at the Wayback Machine., ITAR-TASS, 11 December 2007. Archived 4 March 2008 at the Wayback Machine. ↑ (Russian) Преемником Кони стал Дорофей Archived 11 August 2010 at the Wayback Machine. Moskovsky Komsomolets 15 March 2008 Archived 11 August 2010 at the Wayback Machine. ↑ A Soft-Spoken, 'Smart-Kid' Lawyer Archived 5 May 2008 at the Wayback Machine., The Moscow Times, 2 November 2007. Archived 5 May 2008 at the Wayback Machine. ↑ (Russian) Дмитрий Медведев: учите олбанский!, Lenta.ru, 5 March 2007. ↑ (Russian) Превед, Медвед, Polit.ru, 18 December 2007. ↑ (Russian) Законы РФ / Федеральный закон от 27 июля 2004 г. N 79-ФЗ "О государственной гражданской службе Российской Федерации" (с изменениями от 2 февраля 2006 г., 2 марта, 12 апреля, 1 декабря 2007 г.) Archived 4 February 2008 at the Wayback Machine., Garant Database of Laws with Commentary. Archived 4 February 2008 at the Wayback Machine. ↑ Muratov, Dmitry (15 April 2009). "Декларация Медведева. Год 2009 (Interview with Dmitri Medvedev)". Novaya Gazeta N39 (in Russian). Retrieved 15 April 2009. Wikimedia Commons has media related to Dmitry Medvedev.